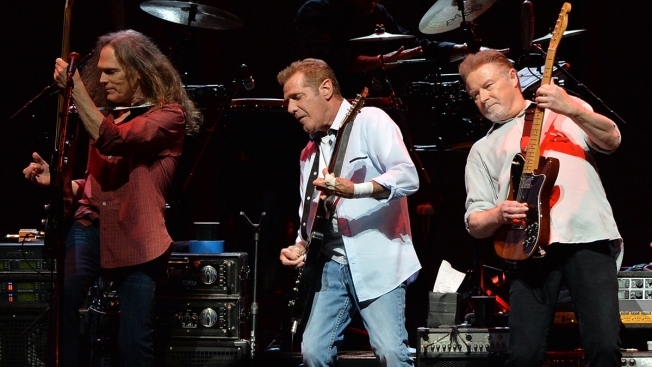 This Oct. 16, 2013, file photo shows, from left, Timothy B. Schmit, Glenn Frey and Don Henley perform during "History Of The Eagles Live in Concert" at the Bridgestone Arena in Nashville. The Eagles' greatest hits album has moonwalked past Michael Jackson's "Thriller" to become history's best-selling album of all-time. RIAA also said that the Eagles' "Hotel California," released in 1977, is now 26x platinum and that makes it the third best-selling album of all-time.